One of the most important things to remember as a homeowner is to replace your air filters. Why? Air filters clean your air of any pollutants, so over time it becomes filled with dirt, debris, and bacteria. So poorly maintained air filters can only hurt your indoor air quality and the energy efficiency of your unit. Make sure the power is turned off to your HVAC unit. Remove the air conditioner component with a screwdriver. 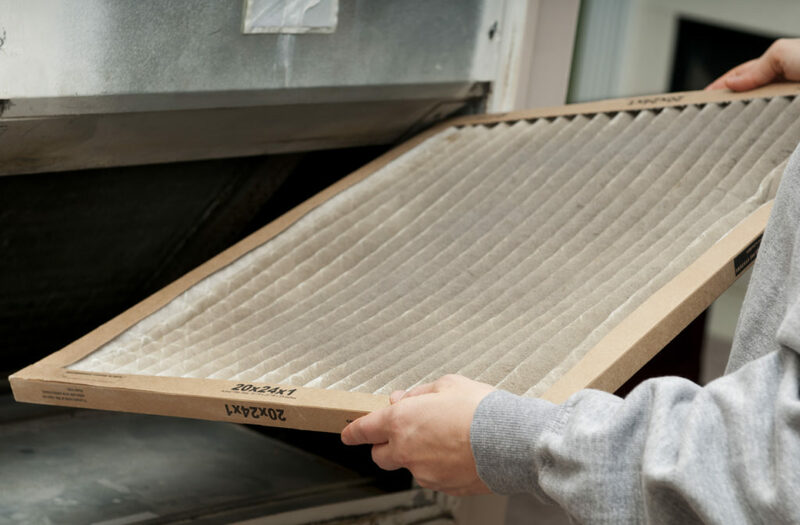 Remove the filters and inspect them for any signs of wear and tear — this could mean an issue with your HVAC system. If it’s not time yet to replace your air filters than vacuum the accumulated dirt and grime to reuse them instead. Fill your sink up with half water and half vinegar — this helps kill any bacteria on the air filter. Make sure to leave the air filters soaking for about four to five hours. Allow your filter to dry (the amount of time will vary), and replace the air filter back in its place. Our team at Dean’s Professional Plumbing, Heating, Air & Drains has over 35 years of combined industry experience. We know how much of an investment a central air conditioning unit is and we know how important it is to you. Whether you have an issue with maintenance or need repairs, our team can help! We have some of the best technicians in the business and always strive for 100% customer satisfaction. Call us today for your AC service or tune-up.